“Central Coast Active is an excellent solution for business advertising in San Luis Obispo County in the health and fitness industry or those companies who would like to reach this desirable demographic,” Brennan says. The new magazine is generating positive buzz. “The magazine is terrific,” says Genie S. “Now that’s what I’m talking about! 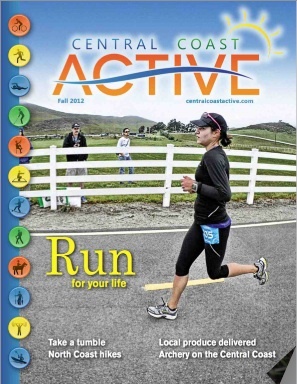 Finally a local magazine written by and for local athletes,” says Sheryl C. “It looks awesome,” says Shelby K.
Central Coast Active boasts over 20,000 readers. It is delivered to racks at over 250 gyms, offices, health and fitness locations around the county. Over 1,000 copies are mailed to subscribers and businesses. The magazine is published quarterly. Celebrated stories include: locals return the San Luis Obispo Marathon, beautiful road bike courses, profile of the Central Coast Tri-Sports Club, disc golf on the Central Coast, a profile of K-Man Cyclery, kayaking the ocean blue, hike SLO county, and connecting to weight loss. Upcoming articles include Skydiving Pismo Beach, riding the zip lines of Santa Margarita Ranch, inspirational marathon runners, Rugby teams of San Luis Obispo County, a profile of Kevin Kennedy, founder of Kennedy Club Fitness, the health benefits of wine, upcoming races and events and much more. 1446 Spring Street, Suite 205, Paso Robles, CA 93446, (805) 239-7443. 6656 Moonstone Beach Drive, Cambria, CA 93428, (805) 927-5888. 1305 Vine Street, Paso Robles, CA 93446, (805) 441-6400. 72 South Main Street, Ste. B, Templeton, CA 93465, (805) 434-5933. Go Fitness Central Coast, Kevin Forsythe, Law Offices of Kara Schacher, Momentum Paddle Sports, Opolo Vineyards, Pacific Energy Company, Paragon, Paso Robles Harvest Marathon , Pismodise, Rev SLO, Revamp Training Studio, Sea For Yourself Kayaks, Sea Horse Ranch, SLO Coast Kayaks, SLO Country Club, SLO Touch Massage, Snap Fitness, Sycamore Mineral Springs, The Luffa Farm, and The Natural Alternative. Access Publishing provides local business marketing solutions. It is a local leader in online marketing, Internet advertising, local search engine optimization, SEO, SEM, web design, writing and graphic design. The Paso Robles based business, owned by Scott and Beth Brennan, has 10 creative and hardworking employees.